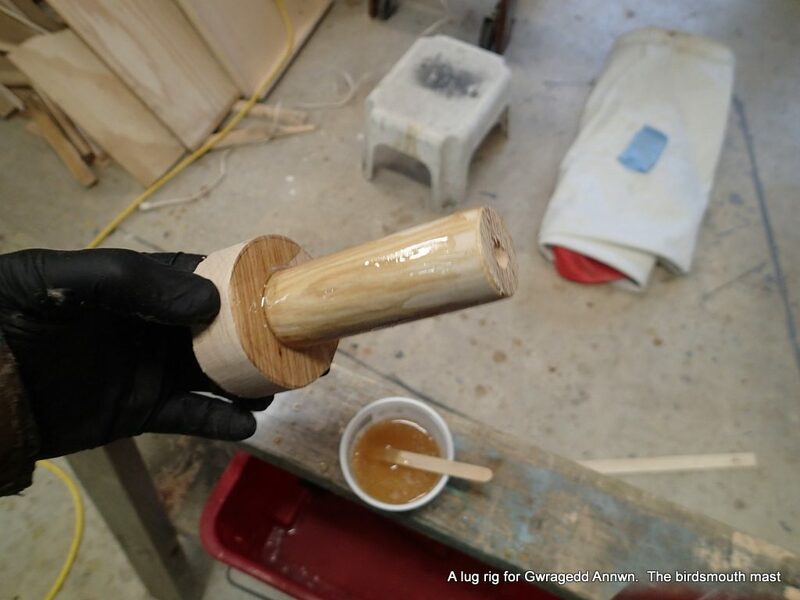 The epoxy glueing the Masthead Sheave plug to the Masthead is now cured. 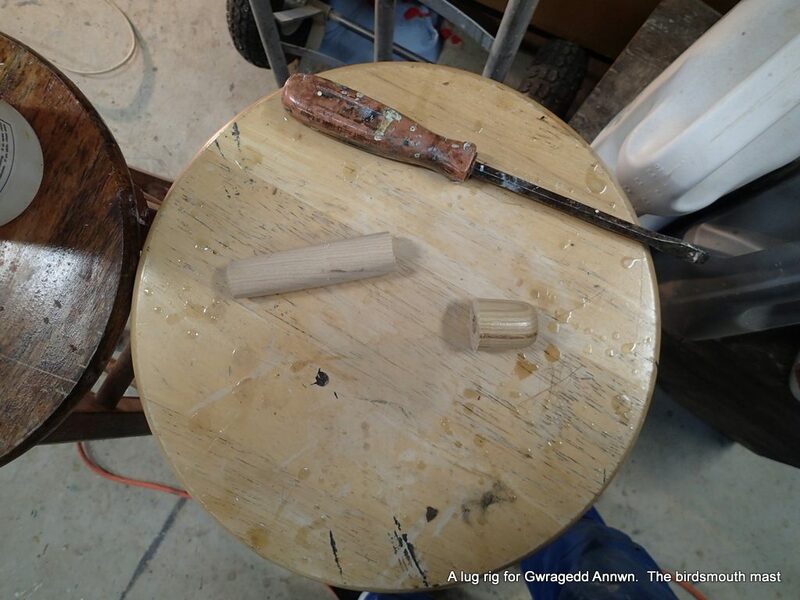 I quickly sand off the excess epoxy from the joint. I will re-varnish this spot. It will be covered by reflective tape later. 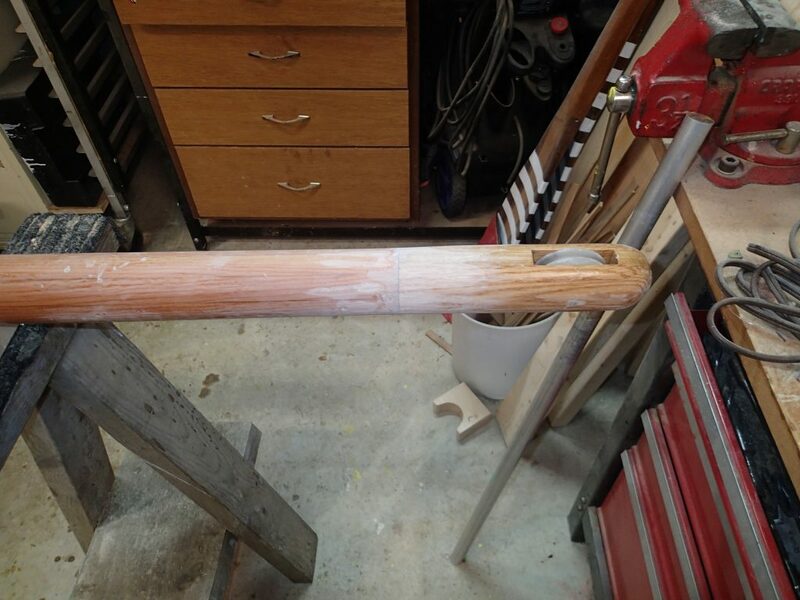 Excess epoxy sanded off with 80 Grit…I will finish with 350 Grit. I going to make up a plug for the mast base. Because I reinforced the exterior of the mast with epoxy & cloth, I do not need as long a reinforcing plug on the inside. I stuff more aluminum foil into the mast. I leave just enough room for the plug stem. I use a plug of aluminum foil to make a “dam” to keep the epoxy from flowing down the mast into the “crumpled for radar reflection” aluminum foil. I was using these for belaying pins. I start with an oak hand shovel handle I bought from Princess Auto. It is almost an exact fit. 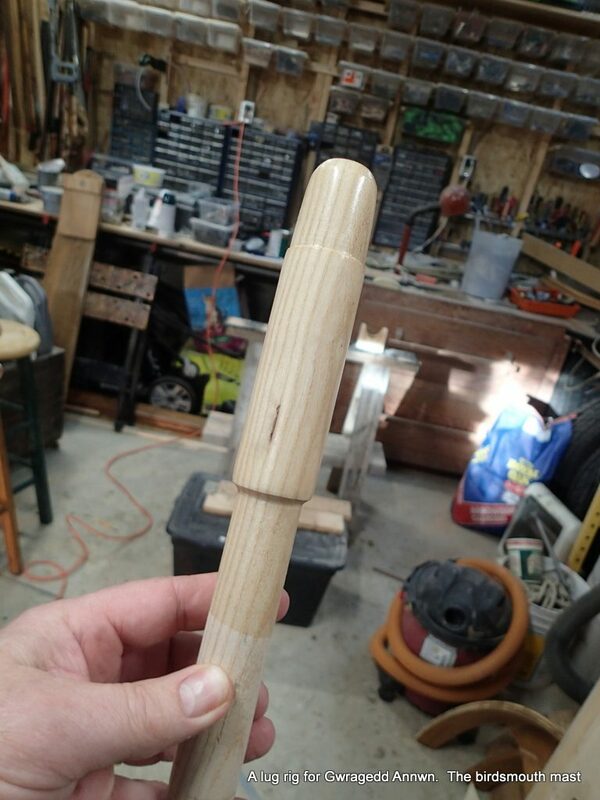 I sand off the finish so the epoxy will soak into the wood. I cut off the rounded top and the excess on the bottom. 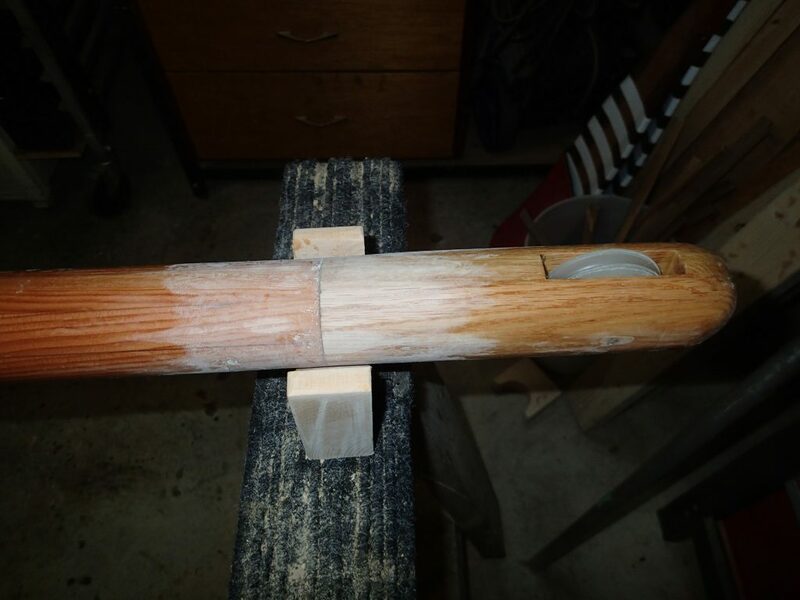 Making the mast base plug. I make up an oak disk, just over 2½” in diameter with a 1″ hole in the centre. 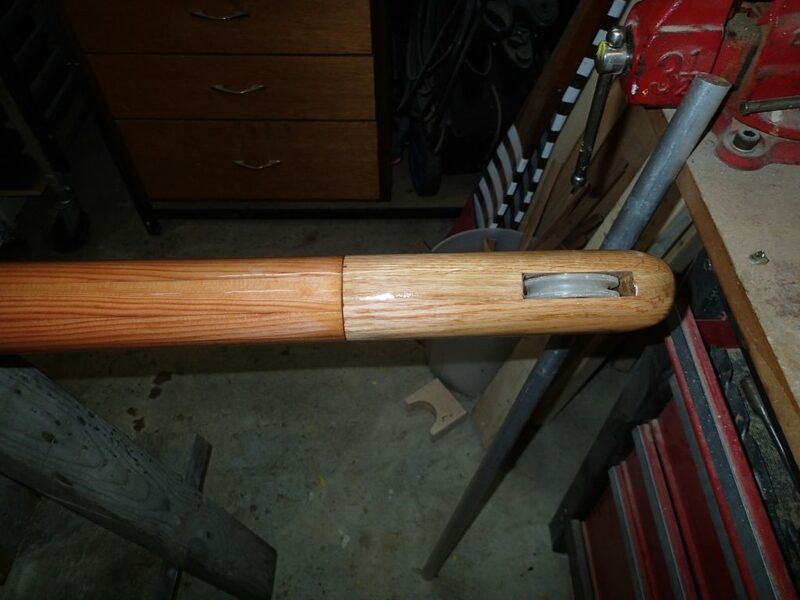 I use my Shopsmith disk sander to round down the shaft of the handle. 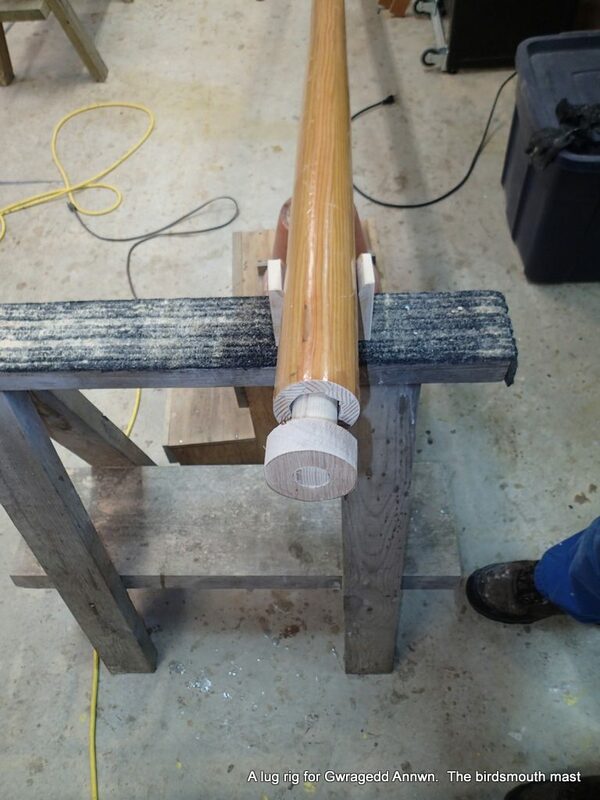 (I then sand the bottom of the mast to bare wood) The disk will fit against the bottom of the mast. 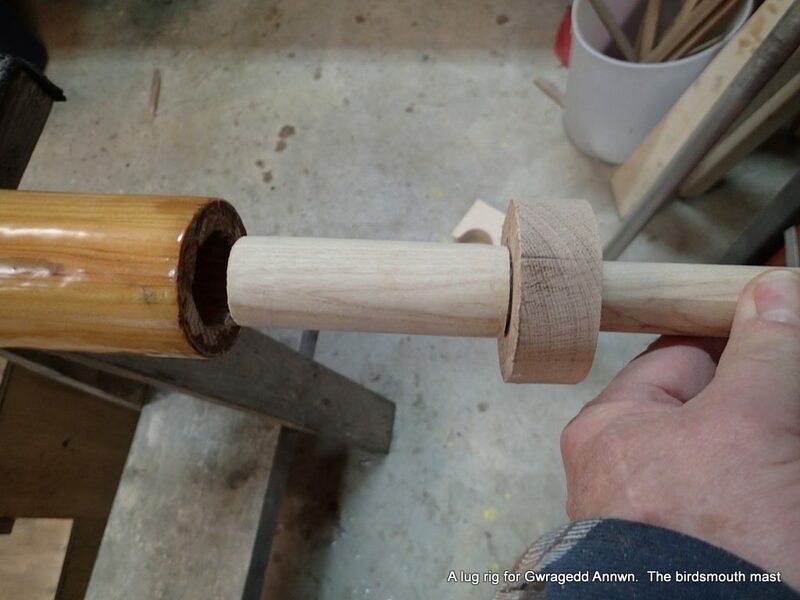 Dry fit of the mast plug. Grain aligned fore and aft to the Masthead Sheave. 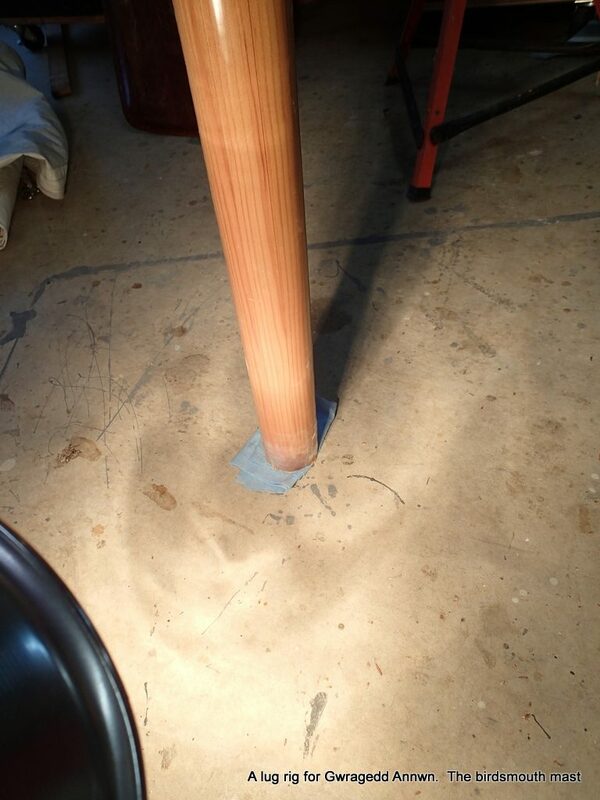 I mix up the epoxy…Two hundred stirs. 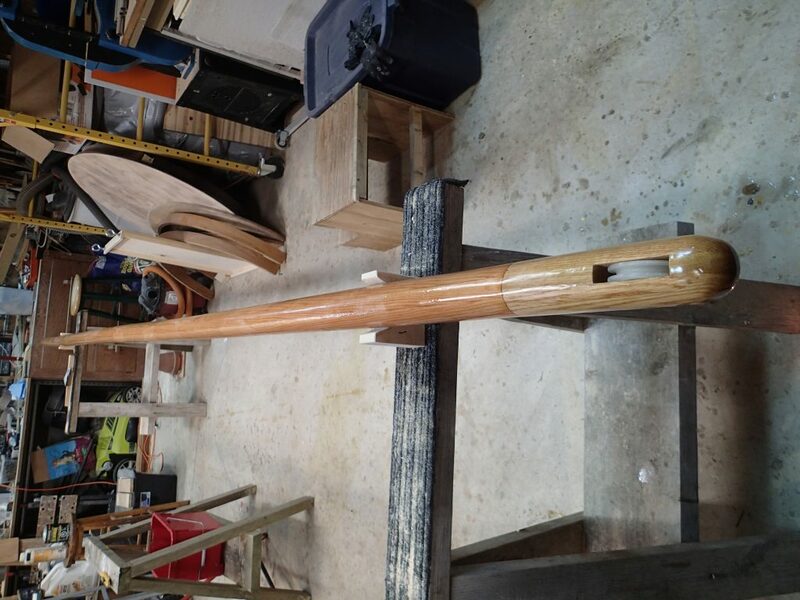 I coat all the bare wood with epoxy, including the mast base inside. 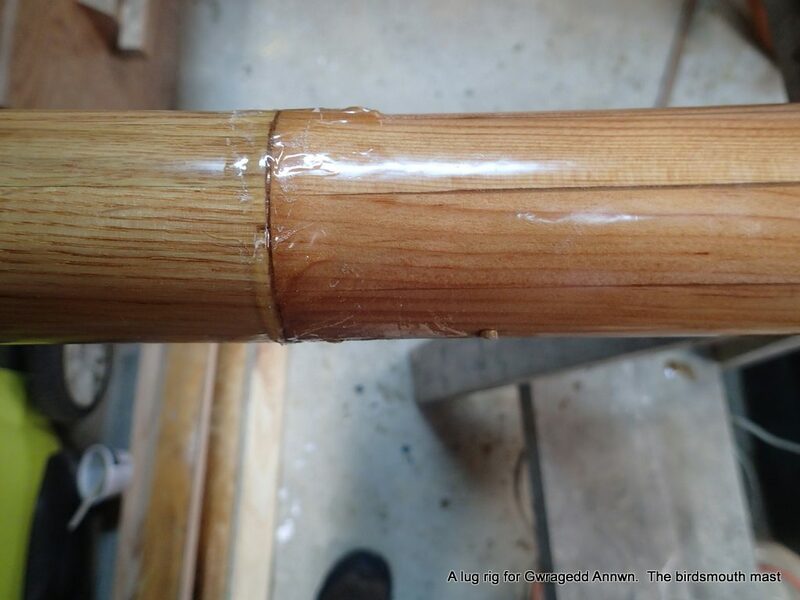 I angle the mast so the base is up and pour the thickened epoxy into it. The Aluminum foil “dam” keeps the epoxy from going into the “crumpled for radar reflection” Aluminum foil while I get the plug glued in. 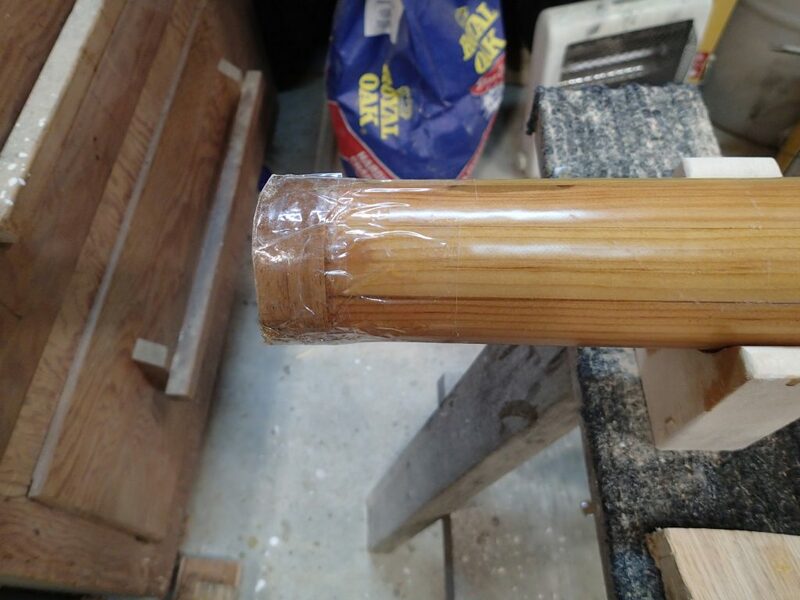 I then wrap the joint with the packing tape to keep the epoxy from leaking out. I stand the mast upright in the garage with the heat lamp on it. The paper towel is for a bit of insulation from the cold floor and if there are any leaks. Now all of the epoxy will flow down around the plug for a good glue-up. The following morning, the epoxy has cured and I remove the packing tape and sand the joint smooth using 80 grit and finish with the wet/dry 350 grit sand paper (using it dry). First coat of varnish. I varnish to the end of the epoxy/cloth reinforcing. I now turn to the other (Masthead) end. I give the Masthead end a light sanding with the 350 wet/dry sandpaper and touch up the varnish. A couple of coats to touch-up the varnish and I will be done! The mast is 17″1″ long and 16′ 10¼” to the centre of the sheave. It is 2½” in diameter at the base, tapering to 2¼” at the masthead. There is 1½ pounds of (radar reflective!!) aluminum foil in the mast. The mast weight is (using my luggage scale) 14lbs. 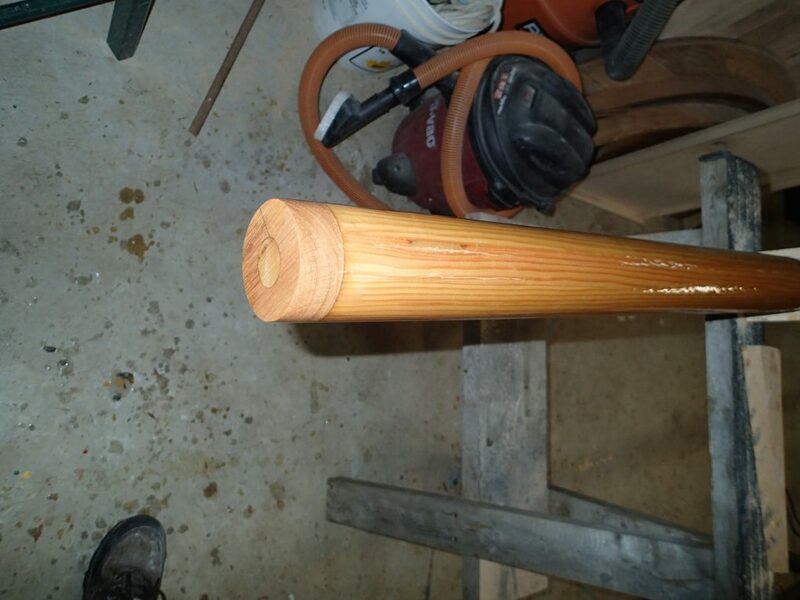 The finished mast…just some varnish drying to do…Then a coat of paste wax. Side view of the mast. Note the reflective strip at the joint, top of the mast. The mast fits quite well. I will have to adjust the mast step and mast partner for a perfect fit. 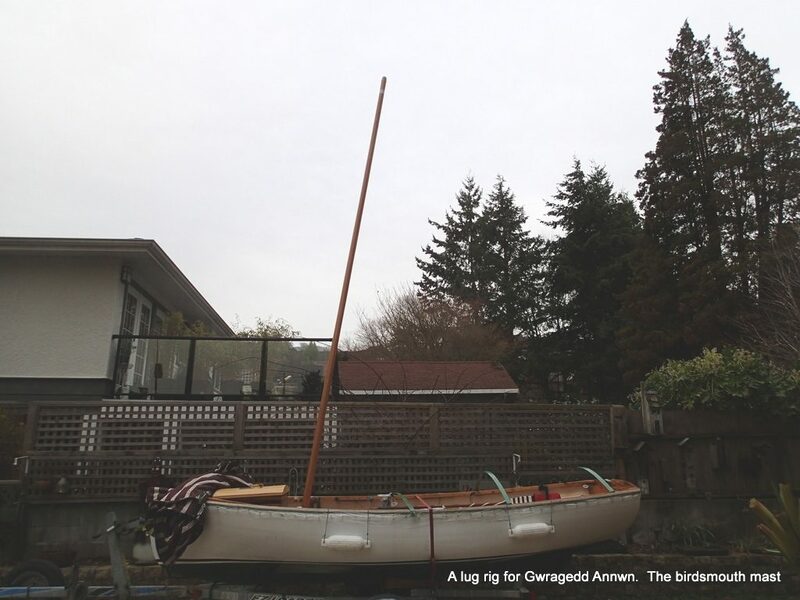 When the rains stop, I will rig Gwragedd Annwn with her new lugsail. 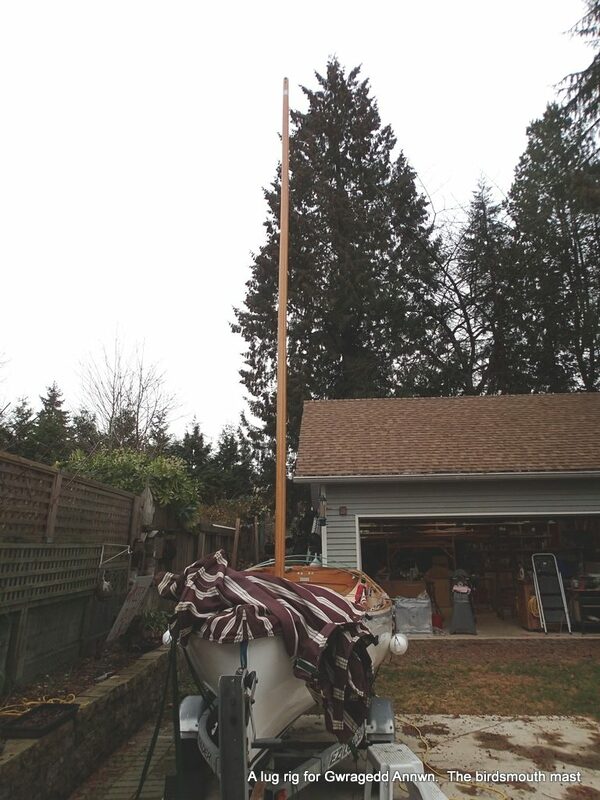 I believe that I will have to move her mast-step and the mast partner to balance her for sailing…a little trial and error is in my future.